The Metropolitan Museum of Art exhibit: Heavenly Bodies: Fashion and the Catholic Imagination (through October 2018) it is a cultural moment of artistic relevance that begs reflection: Why so much effort to showcase the Catholic influence on fashion, as inspired primarily by Catholic liturgy, the Scriptiures, the Church’s sacraments, and the life of her religious orders? Modern culture places a strong emphasis on the body and its image. The desire for self-glorification has its detrimental effects. Excessive vanity leads to unattainable standards of beauty with little anchoring in reality. Amid this overt sensuality, an exhibit of this scale refocuses our attention on the nobility of the human form by draping it in images and symbolism that aim beyond the material and seek to reveal the supernatural. At the heart of this ascension is a concrete vision of reality steeped in a thick anthropology that supposes the body and soul union of each human person, and the capacity of each person to thrive and grow in real virtue—to attain the full beauty and perfection of their created being. This is the backdrop against which we can speak about the Catholic influence on anything created, and also on fashion specifically. The modern dichotomy that separates “body image” from what might be congruently called “soul image” can be repaired by the Catholic teaching that asserts the nobility and unity of the greatest act of creation: man and woman made in imago Dei. Amid the irreverence for the masterpiece that is the human person, we can work to return to reverence. In the Catholic vision, the human person is steadily brought from fallen-ness to glory, from weakness to redemption. When fashion is truly influenced by the Catholic imagination it then becomes the means to render this truth in wearable form. By grace, our material form is clothed in the immaterial, in the substance of things invisible yet real. And moreover, our frail flesh becomes a temple of the Presence of God. “Do you not know that your body is a temple of the Holy Spirit within you, which you have from God? You are not your own; you were bought with a price. So glorify God in your body” (1 Cor 6.19-20). And so it is that in fashion the human body becomes a canvas upon which we can reveal the destiny of every created being: our end is meant to be eternal glory. The haute couture rendition of this reality manifests the universal desire for redemption in millions of gold stitches sewn by the hands of abandoned women upon papal copes from the Sistine Chapel sacristy, or in thousands of hand-sewn beads on a collection of Dolce and Gabbana dresses inspired by the glittering mosaics in Ravenna, or in the extravagant rendition of Eden embroidered in silk upon a Valentino gown. … the Church has not ceased to nurture great appreciation for the value of art as such. Even beyond its typically religious expressions, true art has a close affinity with the world of faith, so that, even in situations where culture and the Church are far apart, art remains a kind of bridge to religious experience. In so far as it seeks the beautiful, fruit of an imagination which rises above the everyday, art is by its nature a kind of appeal to the mystery. Even when they explore the darkest depths of the soul or the most unsettling aspects of evil, artists give voice in a way to the universal desire for redemption. It is a telling thing the focus of this exhibit is wearable art. Independently of the shocking or explicitly inappropriate attempts that have been made to blend the two seemingly contradictory worlds of Catholicism and the avant garde, we must hold that the Catholic vision of beauty is unitive. It is anchored in the reality of the material form that is each body and in the expectation of the perfection of the soul by grace. There is yet a lot about this truth that remains unknown. We need a new catechesis of beauty: one that proclaims the beauty of the truth at the heart of the modern struggle to incarnate it. Provoked by the idols he saw, St. Paul once walked the pagan streets of Athens, and seeing an altar the Greeks had erected to the “unknown God”, stood in the Areopagus and exhorted them: “The God who made the world and everything in it, being Lord of heaven and earth, does not live in shrines made by man, nor is he served by human hands, as though he needed anything, since he himself gives to all men life and breath and everything” (Acts 17.23-25). Athens of the first century and New York of the twenty-first are not much different. The Faith is still largely unknown, and many still seek the unknown God. There is a hunger among our contemporaries to discover that which spiritual poverty has long deprived them. Amid this impoverishment both inside and outside the Church, we believe God “is not far from each one of us, for ‘in him we live and move and have our being’” (cf. Acts 17.27-28). 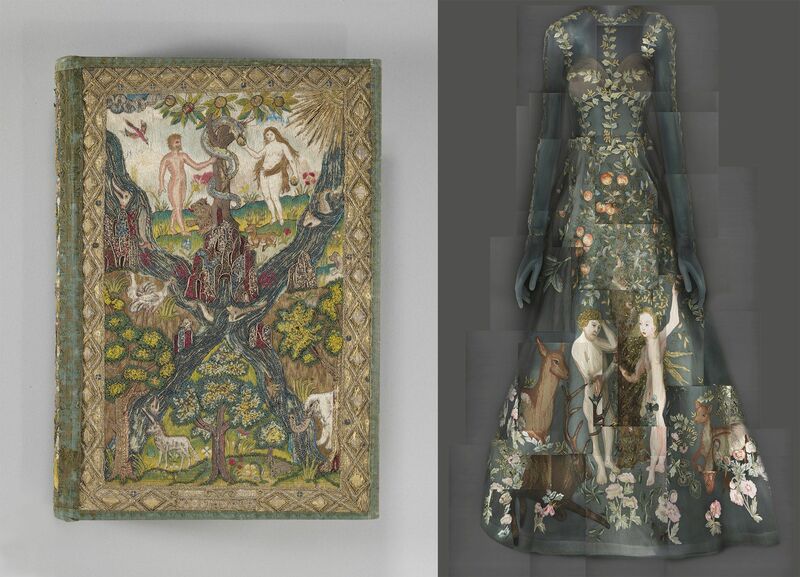 The Met exhibit showcases garments that teach something elemental about the power of the truths and traditions of the Faith to captivate every human person. In this conversation between the sacred and the mundane, we gain access both to artistic mastery and the incarnate extravagance of mystery. There is a distinction between excess, expressed as poor taste, mockery, or even sacrilege, and munificence, the virtue of proper and ordered lavishness. The elaborate detail of liturgical pontifical garb and the simplicity of monastic habits, juxtaposed with rich references to the Catholicism of the Byzantine Empire in exemplars of modern haute couture fashion all indicate something that transcends the material by claiming a far greater scope and identity. Here the world of fashion meets what many are calling the “Catholic Imagination”, and the result is often stunning. And so we see that sacred art and sacred ritual point beyond themselves and remind us not just of the capacity for artistry that some actualize with extraordinary talent, but that this excellence is livable, and that we are free to live it. As it aims higher, the realm of the sacred expressed artistically becomes a reference for us by which we begin to see what we are made for, irrespective of how far we may yet be from the goal. In a culture where we are habituated simply to see the surface significance of what is before us, works of exquisite magnificence and intricacy, made solely for use in liturgical contexts, also say something profound about what is happening in the act of worship. More so, that say something of colossal significance about what is happening to us in the act of worship: the transformation of the human soul in faith. This expansion of our capacity to progress from things that are visible to behold those that are invisible is an intrinsically ennobling transformation. And so mastery and extravagance rooted in the patrimony and the traditions of faith are not only justified, but necessary. And we need to see more of both engaged in a modern key. Modern culture needs to be encouraged to reflect beyond itself on those things that transcended the purely material and aim for its redemption. The timelessness of the Catholic vision—a vision that claims the truth of eternal life and our capacity to arrive at eternal beatitude and not simply imagine it—must enter our modern debates and permeate them with hope. Since nothing is exempt from the Catholic vision, fashion and other forms of artistic expression play a critical role in expressing it. The Church has a prime opportunity in a cultural moment of this scale to return to an understanding of the power of her patrimony both to instruct the faithful, and to engage those on the cultural peripheries. The goal in all this is salvation. All flesh yearns for redemption. Heaven is real. And the glorification of the body we hope for there begins here on earth. This is the Catholic vision we dare imagine, and one day, pray, will behold unveiled.